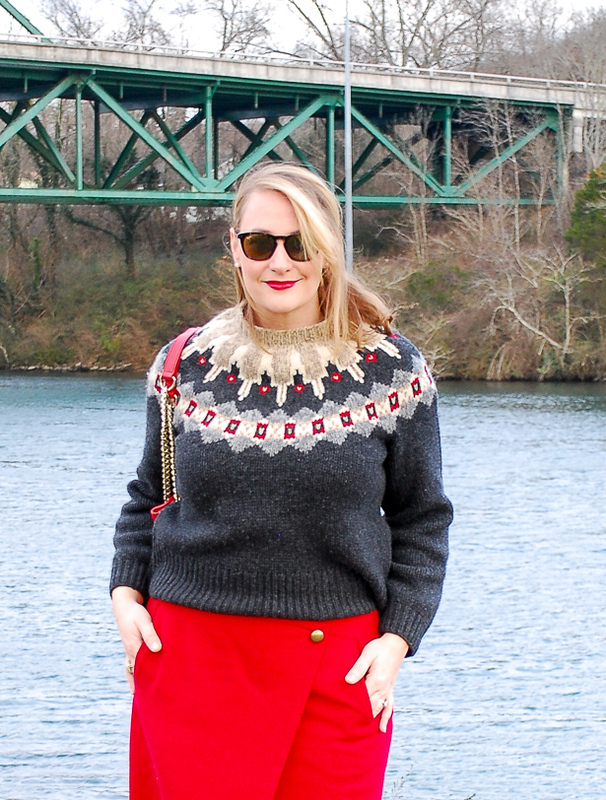 Wrap yourself in a stylish wool on wool outfit to beat the bitter winter weather. If we are to believe Punxsutawney Phil, which I am want to do (I mean he looks like a truthful little fellow), then we had best prepare ourselves for 6 more weeks of winter! So don’t pack away those sweaters and muffs, I have a feeling Jack Frost will be blowing a few more wintery breezes our way. For those particularly bitter days I rely on wool, wool, and more wool! You would be shocked I’m sure to learn how many people I meet who complain of being cold and then when I examine what they are wearing are head to toe in cotton or some synthetic fiber sweater. This just won’t do y’all! 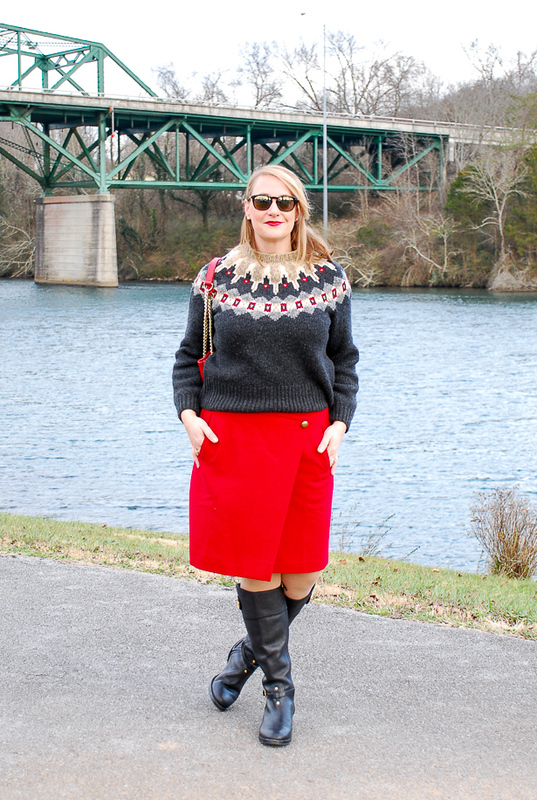 Wool is the answer, and it doesn’t have to be frumpy or itchy! 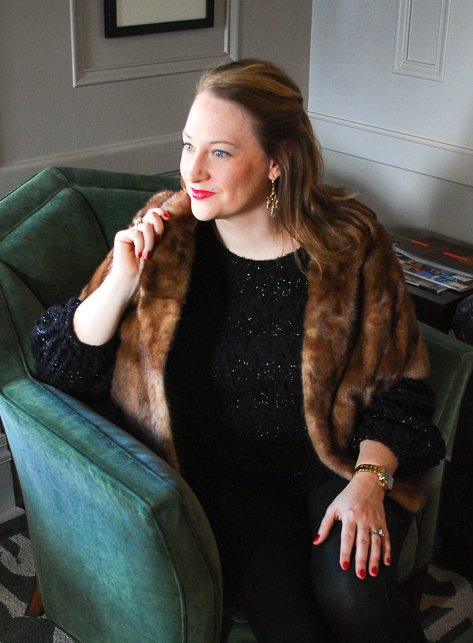 Plus, right now is a great time to find budget friendly buys on wool sweaters and such as all the brands are discounting winter fashion to push spring styles! Today’s look is a wool on wool outfit perfect for a lunch date, work meeting, or Sunday brunch. 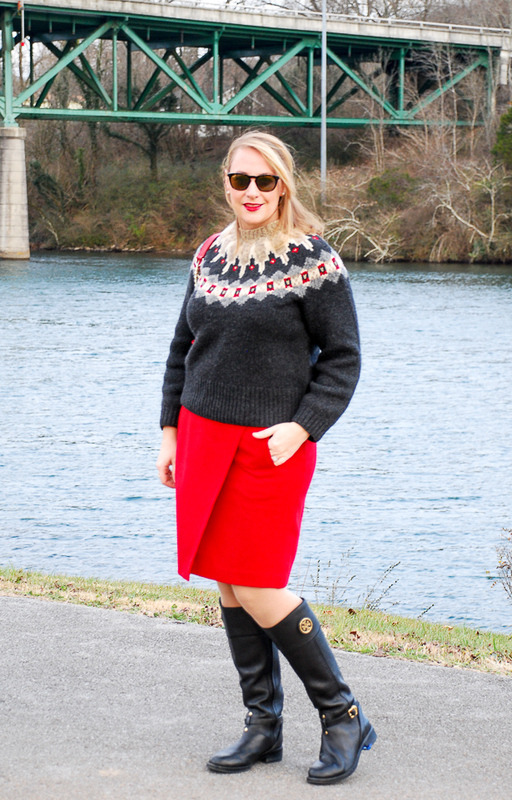 The a-line skirt breaks through its traditional trappings with this bold red color, and I have paired it with a beautiful fair isle sweater done in charcoal grey, soft beige, heather, and hints of bright red. 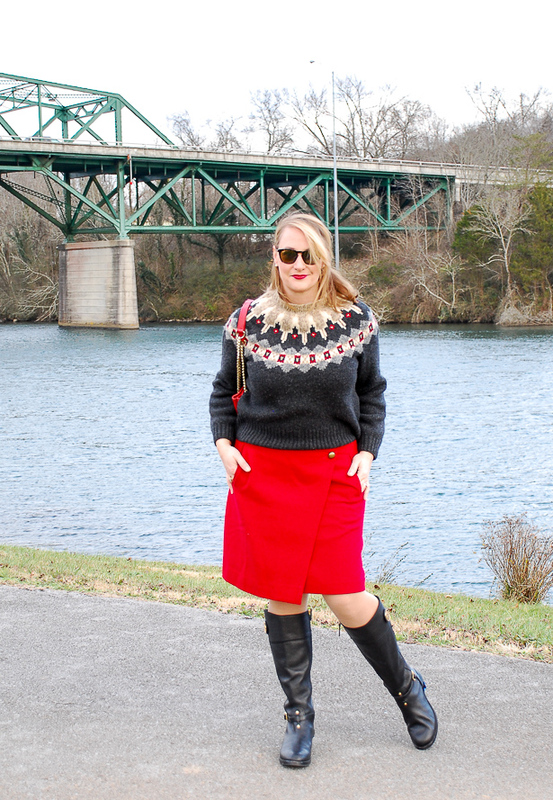 Add some classic black boots and a sassy red lip, and winter wool never looked so good! Oh! One more thought about dressing warm: tights! Splurge on the really thick ones or a wool blend style like these. I promise you will be blissfully toasty! 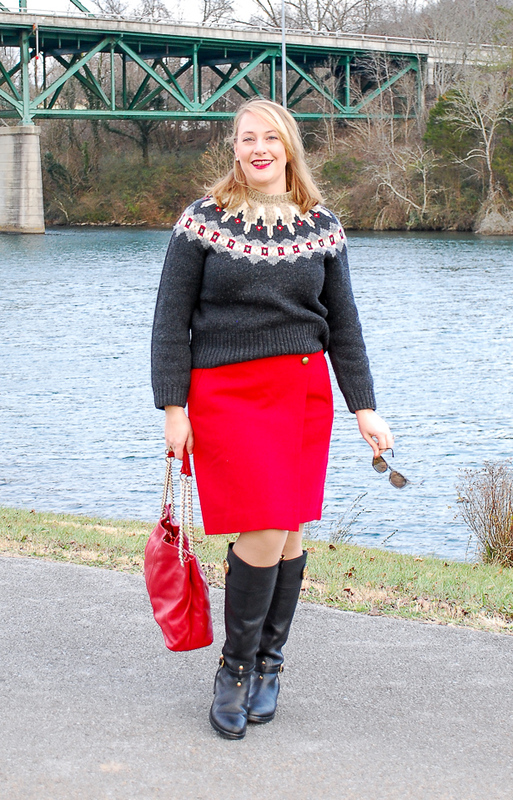 I love the red wool skirt! It brings out the pattern detail in the sweater. Such a gorgeous look for winter! Thanks Ruth! You are so sweet. I just love when an outfit comes together so well! What a beautiful outfit! I love your classic style. Thank you! 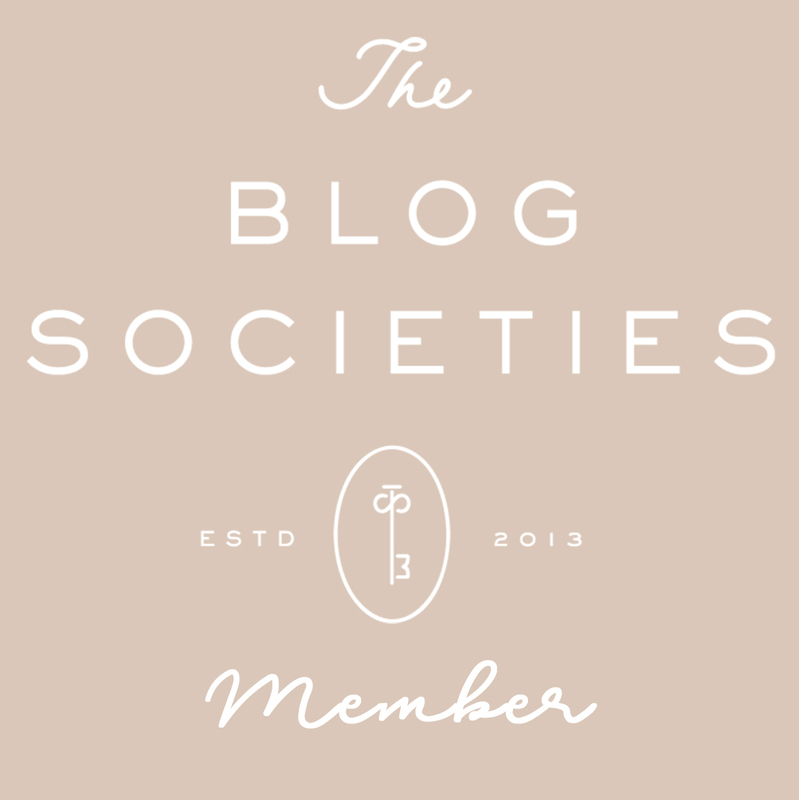 Seriously blushing a bit over here! !